Roxi Item Builds Guide for Arena of Valor (AoV). Each build is geared toward a different play style, so choose one that fits your personal preference. These items are necessary in order to play Roxie optimally. Only diverge from a core item if you are a very experienced player or you have a very good reason for doing so. Frosty’s Revenge Despite it seeming to go against her all-fire-all-the-time style, Frosty’s Revenge offers a tremendous amount to Roxie’s kit and is invaluable to the adventurer as a result. Enemies caught within Roxie’s flames will have a harder time escaping, now having to deal with a slow alongside the ticking burn damage. The item additionally improves Roxie’s movement speed, making her even better at spreading out fire and catching enemies, and some additional health to give her some extra protection from enemy attacks. Gaia’s Standard As a tank who will be initiating ganks and team fights, there is no amount of durability that is too much for Roxie. Gaia’s Standard helps pad out her life with magic defense, additional HP, and a restorative passive that will help her stay up and going in fights. What’s more, the item also provides additional movement speed, making it easier for Roxie to approach enemies and spread out her fire. Mantle of Ra While not offering any of the HP that she usually goes after, Mantle of Ra offers an additional burn to enemies near the wearer. This will increase the amount of damage done to enemies caught by Agnie’s Grasp while also improving Roxie’s resilience to physical attacks with the armor it offers. Berith’s Agony Berith’s Agony is a bit like the magic version of Mantle of Ra, especially considering the way it synergizes with Roxie’s kit. Every enemy damaged by Wild Fire is affected by Berith’s Agony’s Torture passive, meaning they automatically lose 9% of their remaining health (minus magic defense). While this is yet another item that doesn’t help with Roxie’s love of HP, the burn damage is oftentimes too much to pass up. The Aegis The Aegis offers the wielder a lot of protection from physical damage as well as significant utility through additional mana and cooldown reduction. Roxie’s channel makes her always hungry for mana, and the cooldown reduction will allow her to speed around the map with Blazing Shield and grab people with Agnie’s Grasp more frequently. The item additionally slows any attackers that damage the wearer, no matter their range. As Roxie is vulnerable to ranged attacks, this can be an essential way to stave off attackers. 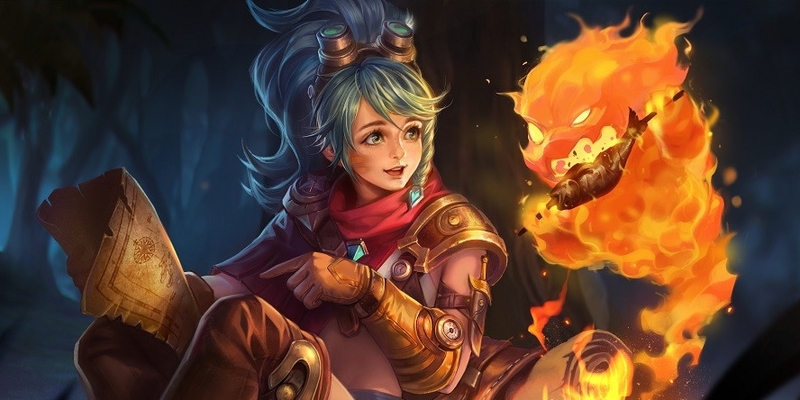 Leviathan While she lacks the clear speed to be an effective jungler, Leviathan can be a useful tool both in building up Roxie’s defenses and counter jungling. The item offers her lots of health and a bit of armor, both great assets to a tank. More importantly, though, it offers an additional burn, giving Roxie some additional damage when dragging foes with Agnie’s Grasp. Between Leviathan, Mantle of Ra, and Wild Fire, Roxie will be able to chip away tons of health from her target to assist her team in taking them down. Soaring Aura Since she deals magic damage and scales very poorly with ability power, magic pierce can be the best way to up her damage. Soaring Aura is the best item for this, lowering the magic defense of everyone nearby rather than just piercing through. This allows allies to benefit from the reduction as well. The item additionally offers health, giving Roxie some minor survivability benefits as well. Mail of Pain As stated before, Roxie is more vulnerable to ranged attackers than to melee fighters. Mail of Pain can help her out here, punishing physical attackers that attack the wearer. This is particularly effective against marksmen, they relying primarily on their normal attacks for damage. Amulet of Longevity Not only does Amulet of Longevity amp up her health, something that Roxie is particularly fond due to her passive, Amulet of Longevity increases the amount of health that Roxie receives from marked enemies in Wild Fire and Gaia’s Standard’s passive. Here we use Leviathan to give Roxie an additional burn, upping her damage potential in close quarters. The item will also grow to offer significant amounts of health, amplified further by Amulet of Longevity. Between these and the health boosts provided by both Gaia’s Standard and Frosty’s Revenge, Roxie will be an HP powerhouse with 6,325 additional HP coming in from items. Standard disclaimer: don’t jungle with Roxie, Leviathan is for use in a solo lane. A bit of a gimmick, but it can really hurt opponents. Here we stack Leviathan and Mantle of Ra in order to use both of their burning auras on top of Wild Fire. It will not take long at all for enemies to feel the burn, taking 495 damage a second when caught in all three damaging fields. Soaring Aura will ensure that enemies take the full brunt of this damage while Frosty’s Revenge holds them nice and close in the damage. Update: with the Berith’s Agony buff in version 16, we decide to bring it up a notch and go for quadruple burn. In addition to the damage listed above, enemies hit by Wild Fire will lose 9% of their remaining health, with the Torture passive re-triggering every instant the enemy continues to stand in Wild Fire. That is my current order but any improvements would be appreciated ???? A fairly standard build that takes a lot of the items we have focused on above. Player’s will be mobile, durable, and able to do significant amounts of damage to their foes. My offensive tank build is: Gilded Greaves – Mantle of Ra – Zweihander – Gaia’a Standard – The Aegis – Amulet of Longevity (or med of Troy or Eternity). My Roxie build is a jungle build. It consists of Leviathan, gilded greaves, Aegis, Frosty, Gaia, Berith’s. That is my current order but any improvements would be appreciated ???? Well, I guess it can go, Gaia, frosty which kinda makes more sense now that I think about it haha. We cannot understand Spanish. Sorry.